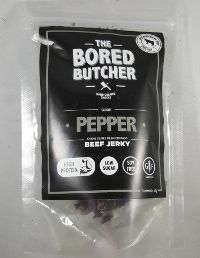 The next review on The Bored Butcher will be on a 2.1 ounce/60 gram bag of their pepper flavored beef jerky. This jerky was kindly submitted for review by co-owners Gabriel Amador and Gabriel Costa. 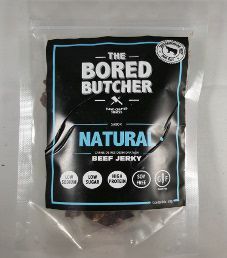 The next review on The Bored Butcher will be on a 2.1 ounce/60 gram bag of their natural flavored beef jerky. This jerky was graciously submitted for review by co-owners Gabriel Amador and Gabriel Costa. 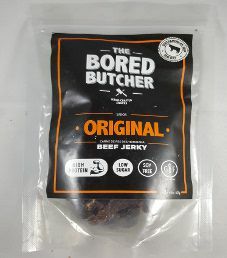 The first review for The Bored Butcher will focus on a 2.1 ounce/60 gram bag of their original flavored beef jerky. This jerky was kindly submitted for review by co-owners Gabriel Amador and Gabriel Costa.